This illustration is from the 1939 edition of "Contes Et Legendes (Premiere Partie)" by H.A. Guerber. It was part of Harrap's Modern Language Series. "This little collection of Legends and Fairy Tales is intended merely as an introduction to general French reading. The stories have been told as simply as possible, with infinite repetition of the same words and idioms to enable the pupil to obtain a good vocabulary almost unconsciously. They have also been narrated as graphically as practicable to arouse an interest in the plot, to stimulate curiosity, and thereby induce the pupil to read to the end. "With the exception of the first tale of the series, for which I have purposely selected the common nursery story, 'The Three Bears,' I have carefully avoided the tales which are most familiar, or have given them in some unusual version, so that only by knowing the meaning of the words the sense of the story can be obtained." 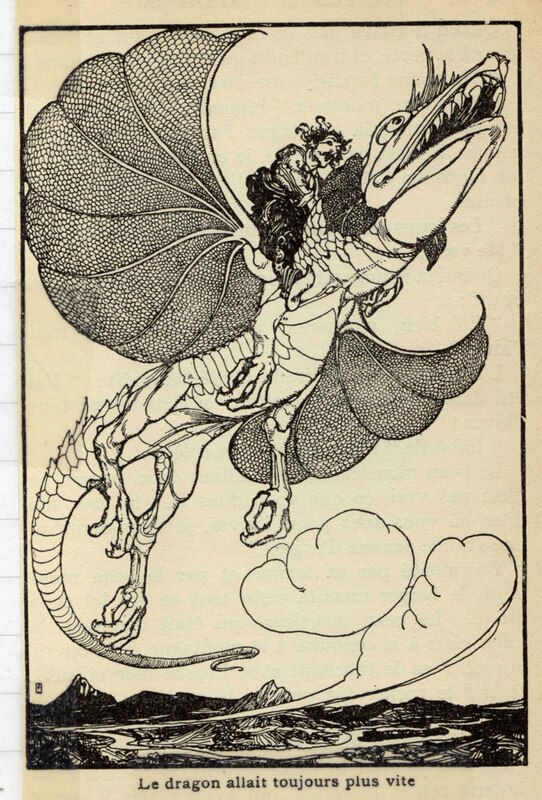 The French caption on the above fantastical image states: "Le dragon allait toujours plus vite". According to Yahoo! Babel Fish2, that translates to: "The dragon went always more quickly". 1. The full text of the book is available at Project Gutenberg. 2. Yahoo! Babel Fish is named after the fictional animal used for language translation in Douglas Adams' series The Hitchhiker's Guide to the Galaxy. The fish name is a reference to the biblical account of the city of Babel.